Why do so many debut literary novels sell for big money? There is a website called Publisher’s Marketplace, where agents report the book deals they make on behalf of their authors. And if you pay $25 a month (which you should never do, unless you’re doing research on agents), you can browse those deals. And in browsing those deals, you will sometimes see novels selling for huge advances. It’s not common, but it does happen. In the case of genre fiction, this is understandable. Publishers are hoping they’ve got a hit on their hands, so they’re willing to pay for it. But there are also lots of big deals done in literary fiction. Which seems a bit crazy. Are they really selling so many copies of these books? For instance, I read that Aimee Bender (a great story writer) sold a novel + story collection for more than five hundred thousand dollars. Now, with that kind of advance, she’d need to sell at least 200,00+ copies to recoup the investment. Now is that really going to happen? For Aimee Bender? She’s going to hit bestseller levels? I mean…it’s possible (I’m fully open to being told I know nothing), but it seems unlikely. 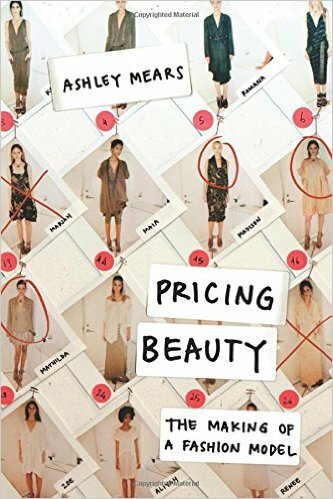 And the second was that I read Ashley Mears’ book Pricing Beauty, which is a sociological study of the modelling industry. And in that book, she talks about the difference between editorial models and commercial models. Commercial models are the ones who sell clothes for big companies. You see them in catalogues. You see them on TV. They’re conventionally beautiful and have a girl-next-door look. And they make, on average, way more money. A commercial model can work for years (she cited one who was still working at age 40) and earns way more per shoot. Editorial models, on the other hand, work in runway fashion shows and for magazines. They’re not conventionally attractive. Some of Mears’ interviewees called them ‘ugly, but distinctive.’ They’re women who have a weird, striking look. They get paid far less, and they have much shorter careers (usually only a few years). In fact, editorial models are usually a net loss for the modeling company that finds them, pays them for a few years, and then never recoups the investment. The accountants at the modeling agencies were incredibly perplexed by this. They kept saying, “Why do we have any editorial models at all? Let’s get them all off our books and start going with just commercial models,” since the latter were the entire source of the modeling agency’s profits. Nonetheless, modeling agents were dismissive of commercial models. They put little effort into finding or developing their careers (treating them as interchangeable commodities) and put most of their work into finding editorial models who might have that striking new look that would make them the defining face of a season or two. That, in their minds, was their real business. Commercial models were merely a profitable sideline. They tried to justify it by saying that the modeling agency needed editorial models in order to maintain its prestige–no one would want to work with them on the commercial side if they weren’t on the cutting edge w/ the editorial models. But I’m not sure they really made that case. If anything, it seemed like commercial models (and the people who hired them) didn’t particularly care what was going on in the editorial side (aside from a mild resentment at the lack of prestige for their work). Does this sound like anything? What’s important here is to realize that companies are full of people. And those people have their own individual motives. Lots of people get into editing with the dream of being the next Gordon Lish or Jonathan Galossi or Maxwell Perkins. And as soon as those people get any kind of power within their company, they start diverting resources towards authors who will further their editors’ own career goals. The company might theoretically want to make money, but the people high up on the editorial side want to create reputations for themselves. And it’s much easier to do that with literary fiction than with genre fiction. I assume some reason for this is also what drives the creation of loss-leading ‘prestige’ imprints (i.e. FSG, Knopf, Henry Holt, etc). These imprints pay serious money to acquire serious books, but my impression is that the bets don’t usually pay off and the imprints aren’t particularly profitable. However, that’s not the point. The point is that the high-ups at Macmillan (FSG, Henry Holt), for instance, can feel good about the fact that they publish big-name (if not big sale) writers. I think this is very common knowledge in publishing circles, but I haven’t heard it bandied around much on the net, so there you go. I’ve learned the absolute best way to get invited to parties! Hmm … makes sense. They they release a ‘Snooki tell-all’ and recoup their losses. It does make sense, but it is a little amazing. This is a massive multinational media corporation (Simon and Schuster, for instance, is owned by CBS) that’s releasing books purely for artistic, rather than profit-related, purposes. Really interesting piece – I guess the biggest advances are for the books which are easy for publishers to mass market. The absolute biggest, yes. But literary novels (which aren’t particularly easy to market) get disproportionately large advances. Amongst literary novels, though, the largest _are_ the ones that have some book club potential (usually ones about WWII or something like that).